As with generic interfaces, generic delegate types are contravariant if you mark input parameters as in. In the example below, we’re unable to assign an instance of ReturnDelegate<Dog> to ReturnDelegate<Terrier>. The delegate type is not contravariant. We can get the delegate type to behave contravariantly by marking its type parameter with the in keyword. We can now assign an instance of ReportOnDelegate<Dog> to a variable of type ReportOnDelegate<Terrier>. As with generic interfaces, generic delegate types are covariant if you mark output parameters as out. In the example below, we’re unable to assign an instance of ReturnDelegate<Terrier> to ReturnDelegate<Dog>. The delegate type is not covariant. We can get the delegate type to behave covariantly by marking its type parameter with the out keyword. We can now assign an instance of ReturnDelegate<Terrier> to a variable of type ReturnDelegate<Dog>. When you assign a method to an instance of a delegate, input parameters in the delegate may be more specific than corresponding parameters in the method. Similarly, the return type of the delegate can be less specific (ancestor of) the return type of the method. In the example below, assume that Terrier derives from Dog. Note that if we invoke through the delegate, it returns an instance of the parent class. To assign to the derived class, we need an explicit cast. When you assign a method to an instance of a delegate type (or pass a method name to a method that takes a delegate), the types of the parameters in the method will normally exactly match the types in the declaration of the delegate type. You can, however, assign a method when the type of an input parameter for a delegate is derived from the corresponding parameter type in the method. This is shown in the second chunk of code, below. When you invoke using the delegate, however, you’ll still need to pass an object whose type is the more derived type. Different delegate types are not assignment compatible, even if they define the same method signature. For example, suppose we have two delegate types with the same signature and a method that matches the signature. 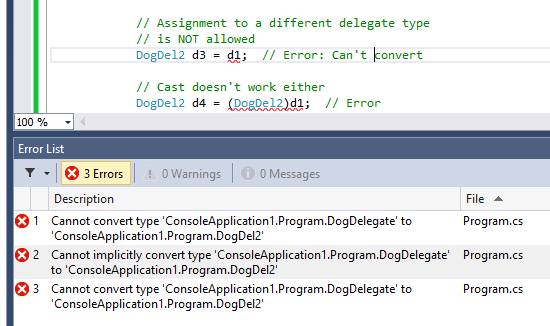 Notice below that we can’t assign an instance of DogDelegate to a variable of type DogDel2, even if we use a cast. The .NET Framework includes the Action predefined delegate type that represents the signature of a method that accepts zero or more parameters and does not have a return value (i.e. returns void). However, you could instead use the Action delegate type, avoiding the definition of your own custom delegate type. The .NET Framework includes the Func predefined delegate type, which represents the signature of a method that returns some type and accepts zero or more parameters. However, you could instead use the Func delegate type, avoiding the definition of your own custom delegate type. Func<T,T,T> indicates that we’ll pass in a function that takes two parameters of a given type and returns a value of the same type.